Charlotte – Oct. 7, 2015 – The southeastern U.S. is now the nation’s fastest growing Latino region, with many historians calling this cultural shift the South’s biggest post-Civil Rights story. To better understand this powerful transformation, Charlotte Teachers Institute (CTI) joins Levine Museum of the New South in exploring the impacts of Latinos on the New South and of the New South on Latinos, in CTI’s Exploding Canons interdisciplinary speakers program. The event will be from 5:15 – 9:00 p.m. Tuesday, Oct. 27, at Levine Museum, 200 E. 7th St., Charlotte. CTI’s Exploding Canons: ¡NUEVOlution! is centered on the Museum’s new, groundbreaking exhibition: ¡NUEVOlution! Latinos and the New South, opening Sept. 27. “This new Exploding Canons event supports the Levine’s goal of bringing together diverse groups to promote deeper understanding and community building,” said CTI Director Scott Gartlan. Gartlan said Exploding Canons talks aim to challenge participants to think differently about a selected topic, and consider multiple perspectives. CTI’s ¡NUEVOlution! speakers panel, representing Davidson College, UNC Charlotte, Charlotte-Mecklenburg Schools, Charlotte and Levine Museum, will frame the story of Latino impact using a variety of liberal arts lenses and lived experiences. 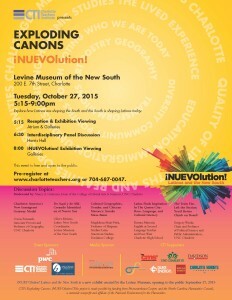 The Oct. 27 program is open to the public without charge and includes admission to the Levine’s ¡NUEVOlution! exhibition. REGISTER HERE. Local organizations representing the Latino community will host information booths about their programs and services during the opening reception at 5:15 p.m., and speaker presentations follow at 6:30 p.m. Nancy Gutierrez, Dean of UNC Charlotte’s College of Liberal Arts & Sciences, will moderate the speakers panel and follow-up discussion. Afterward, the museum galleries will reopen until 9:00 pm. CTI’s Exploding Canons: !NUEVOlution! program is made possible by funding from the North Carolina Humanities Council and Levine Museum of the New South. The opening reception is hosted by PricewaterhouseCoopers and WDAV Public Radio is a media partner. The Charlotte Teachers Institute is an educational partnership among Charlotte-Mecklenburg Schools, Davidson College and the University of North Carolina at Charlotte that works to improve teaching in Charlotte-Mecklenburg public schools. CTI cultivates content-knowledge, creativity, leadership skills and collaboration within and among Charlotte’s public school teachers. Programs include long-term seminars and special events for teachers, as well as community presentations. CTI’s flagship speakers series Exploding Canons draws on the strengths of CTI’s partners to offer collaborative educational opportunities for teachers and the general public that highlight university and college faculty, explore diverse topics in an interdisciplinary manner, and encourage community conversation. Currently, 96 CMS teachers in grades preK-12 are enrolled in eight, multidisciplinary seminars that began in the spring and continue until December, where teachers are creating new curriculum units for their students. These curriculum units generate learning beyond each teacher’s classroom, as the final units are shared with teachers’ school colleagues and are also published on the CTI website, providing access to teachers worldwide. CTI is made possible by a joint commitment of resources from all three Institute partners and through the generosity of private funding institutions such as Wells Fargo, the Belk Foundation, Duke Energy, and the Charlotte Hornets Foundation. The Institute is housed at UNC Charlotte within the College of Liberal Arts & Sciences. For more information, contact CTI Executive Director Scott Gartlan, 704-687-0078, info@charlotteteachers.org. Posted on September 30, 2015 by Robin Mara. This entry was posted in Events, Exploding Canons. Bookmark the permalink.